Mitsubishi Heavy Industries produce a range of multi air heat pumps systems that can be used for heating and cooling, The SCM45ZS-S is a multisplit outdoor unit that can have two indoor units connected to it. The SCM45ZS-S offers good energy efficiency performance across a full range of outside operating temperatures so can provide the sole heating source to a building for example. Each indoor unit has its own remote control with full 7 day timer functions available, each indoor unit can also be set at a different temperature independently of the other when controlling in the same mode, i. Heating mode or cooling mode. 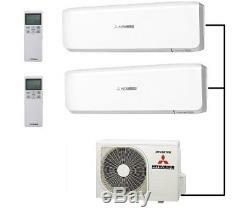 2 x Mitsubishi SRK25ZS-S wall mounted indoor units. Price includes outdoor unit, 2 indoor unit + remote controller. Full reverse cycle heat pumps - Can heat and cool. Very energy efficient at heating and cooling. We also offer an installation kit to install this system see the following listing Accessories : Flared Pipes - Install Kits. This system should be fitted by an F-Gas certificated installer. The item "Mitsubishi Multi Air Conditioning SCM45ZS-S 2 Indoor Wall Units" is in sale since Friday, May 4, 2018. This item is in the category "Home, Furniture & DIY\Heating, Cooling & Air\Air Conditioning".